This week’s French Fridays with Dorie was Cardamom Rice Pilaf. I have never used cardamom before. I bruised the 7 pods like Dorie said and inside were little seeds! I served it with broccolini and teriyaki chicken. It was an incredibly easy and satisfying meal. And the kids actually asked if they could have the leftovers for their school lunch the next day! We really enjoyed last week’s recipe as well but my little helper was in hospital getting his tonsils and adenoids out so didn’t get around to posting it! But it was well worth it, he’s finally sleeping through the night. He can now sleep flat on his back without any gurgling noises! Can’t wait to get back to the French Fridays with Dorie website to check out what others did with this week’s and last week’s recipe! Tags: cooking, food, french food, french fridays with dorie, recipes, rice | Permalink. Bless your little boy. I had mine in tears last night as says he is so sick of not being able to breath properly. He says his throat is ‘blocked’ all the time. Do you think it might be the same thing? He blows his nose a lot too but all they have ever done is put him on antihistamines which don’t seem to help. What we noticed was the size of his tonsils when he yawned! They looked like huge lumps inside his mouth and we wondered how he managed to swallow anything. He was waking most nights coughing so much he would vomit. He sounded like he was drowning in his own phlegm! He also had frequent tonsillitis and any time he caught a virus it made his throat constrict and he found it difficult to breathe. We relied on a bottle of redipred which is a steroid to get us through these times. I think the steroid reduced the swelling in the throat and made it easier for him to breathe. He is only 3 but with winter coming up and him already struggling so much, we were really worried about how he would cope, it’s really scary watching them struggle to breathe! So we are very relieved it is done! I hope your little boy feels better, maybe it’s worth asking your doctor? 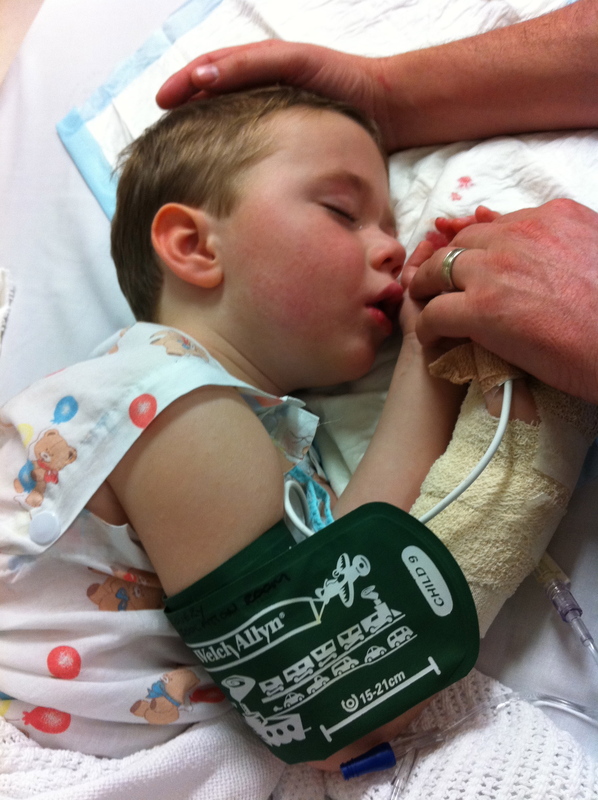 Awww…I hope your son is recovering well from his surgery! My son had his tonsils taken out at 6 too, and the gurgling noises while sleeping also stopped immediately afterwards…amazing. Glad to hear that your kids loved the rice pilaf, they have a really advanced palate! 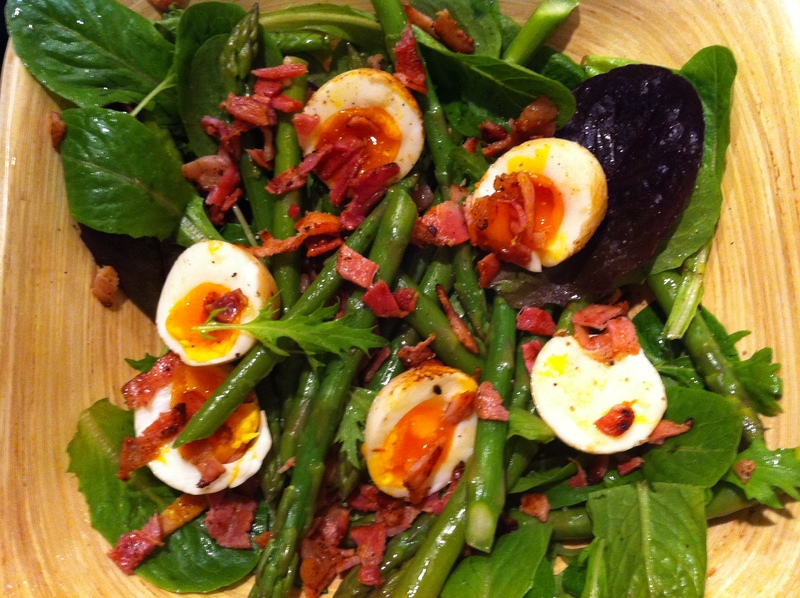 And your asparagus salad from last week looked incredible as well. It really is amazing how quickly you see the results! People told me it would make a big difference but I am still amazed! Your entire meal looks amazing! And yay for sleeping through the night! Thanks for that, I shall book G in to the Dr again and see what they say. Hope your little boy recovers quickly. Glad to read that your little boy is doing well. It’s a good thing the last two FFwD recipes were relatively simple. Take care. Glad your little man is doing better. As a parent, there is no worse feeling than watching them have health issues. Glad you enjoyed all your new dishes! Sounds too easy and too delicious? I make pilaf every so often but never with cardamom. Next time I guess. Oh, I am so glad to hear your son is recovering nicely! 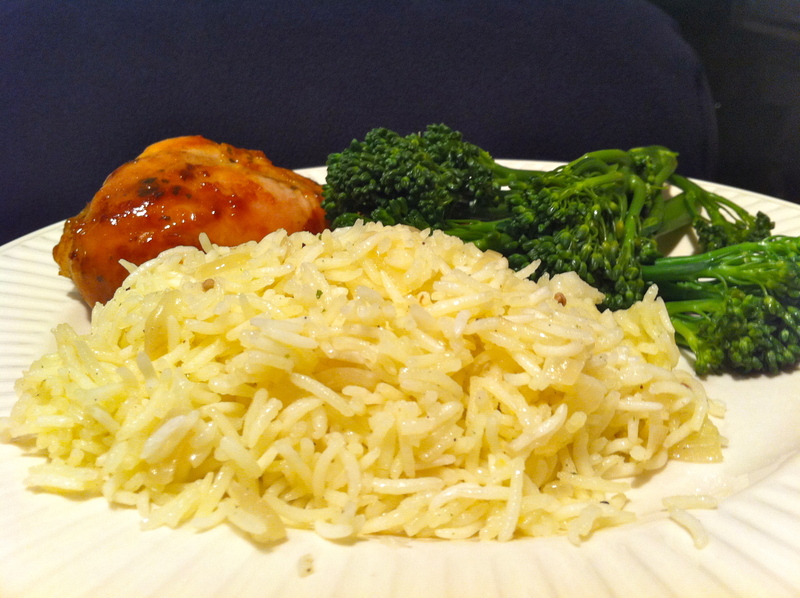 Your rice looks so delicious with the chicken and broccolini. And your salad looks wonderful as well! Ah! As a mom, it pained me to see your little boy had to be in the hospital, but how great to have his breathing be so much better! Yay little helper! Hope you and your son are doing much better…I know it was probably harder on you than on him…but it all sounds quite horrible…I don’t do well with medical issues; feel out of control and hate to see little ones suffering. Your food items are beautiful and a great dinner choices with the pilaf. And good for you to catch up on last weeks cooking and posting too…you’ve had a busy week. Hope this is a good week for you and your family!!! Brings me back to when my daughter got her ear tubes and had her adenoids out. She was throwing up so much from the anesthetic they almost kept her overnight. But it all gets better quickly! Delicious looking meal–I think I need to do more rice! Wow- I am so impressed you managed to get this recipe done with your little one having such issues. Thank goodness it wasn’t “eclair week” 🙂 And thankfully it was easy because we all have to eat dinner, no matter how hectic it gets – esp if you have other children. I love that your 10 year old voted it best rice ever. That would have made me feel like “Mom of the Year” 🙂 And I would seriously love a plate of all those ingredients cut up and combined like you had – yummy !!! What a great mom you are! So happy that your son is doing so well. I’m amazed that you were able to make such wonderful dishes as well with all of that going on! Inspiring! Hope your little guy is continuing to make a good recovery, Sanya. I’m glad the rice was such a hit. Your chicken dish looks delicious! Also, last week’s salad looks yummy. I hope you have a good week. I’m so glad to hear your little helper’s surgery was a success! 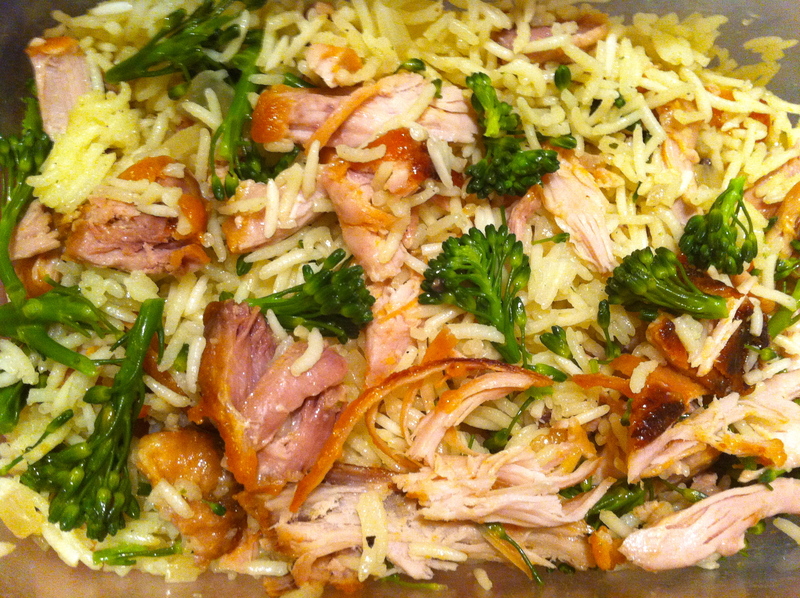 We enjoyed the cardamom rice pilaf too – and my 7 year old seemed to particularly like it. That looks like a beautiful dinner! And happy that your family liked it as well. Glad your little guy is back home and you can make more yummy food together! So glad your son is better & home, I know first hand how difficult it is to have your children in the hospital. Now you all can sleep better! Love your pics, the children liking it is the ultimate seal of approval. Looking forward to more FFWD!